I went round to Mum’s and picked up a carrier of windfall Bramleys. And then I remembered seeing all the blackthorn in blossom over the fields, so I thought I would have a quick saunter over there to see whether they were near enough ready – and the trees are absolutely dripping with sloes. It only took 15 minutes to fill 2 jars, which are now safely in the freezer in readiness to be turned into ruby loveliness for either Christmas or Easter, depending on how long I can hang on! Whizzed round the plot to harvest, but forgot the corn. Must get it tomorrow. 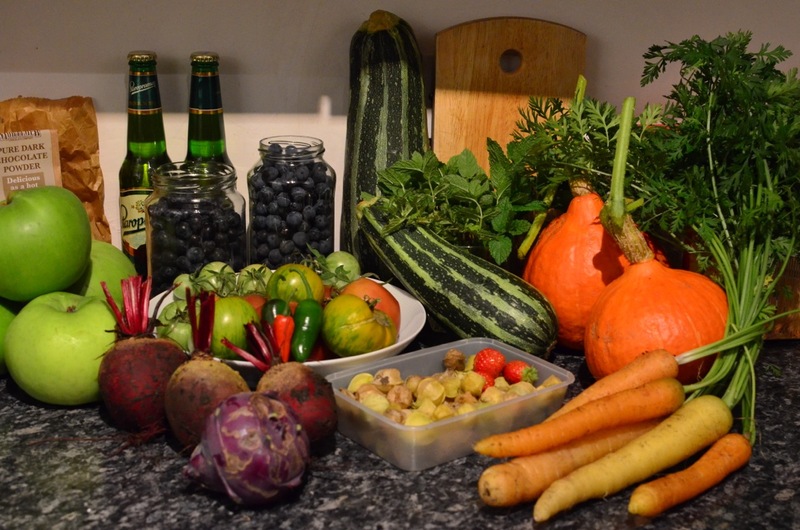 Still, the harvest haul photo is pretty impressive I think. The broccoli has reached the top of the hoop tunnel, which is a bit of a concern – I can’t make it higher!